Who would you say is the “hero” of Tolkien’s series? Is it Frodo? After all, he was the one who bore the Ring of Power to Mount Doom. Some might think the real hero is Gandalf. Without his wisdom and guidance, Middle-earth would surely have been overrun. What about Eowyn? She was the one who could defeat the Witch-King in battle. There are many characters you could choose, but they all have one thing in common: Courage. Tolkien lived during the years when Nazi Germany stood ready to overshadow the world, and no doubt he saw ordinary people called on to perform extraordinary acts of heroism. As Tolkien wrote, “Even the smallest person can change the course of the future.” Even the meekest of Christians can show courage when afraid. I feel like the gift of Hospitality is going out of fashion among Christians. It’s true everyone needs a place where they can take a break from the world, but it has nearly reached the point where Christians are no longer bothering to open the door even to other Christians. Hospitality was not just a virtue but an essential part of Tolkien's Middle-earth. In The Hobbit, Bilbo hosts over a dozen rowdy dwarves who eat everything in his pantry. In The Lord of the Rings the elves are constantly opening their doors to travelers in need. Even the Ents, who are basically walking trees, find ways to accommodate guests when they pass through their forest. Hospitality is not an easy gift, and from the way he writes Tolkien obviously believed it wasn’t supposed to be, but that does not mean it isn’t an important gift. One of my favorite passages from The Hobbit is at the end of the story, where Bilbo Baggins meets with Thorin Oakenshield one last time before they finally part ways. Throughout their adventure Thorin had pursued his lost treasure with unwavering determination, and when it was finally returned, he refused to part with even a piece of it. His greed led to many bad decisions, and in the end he realized what the soulless mound of gold had really cost him. In that moment, he turns to Bilbo and says, “If more of us valued food and cheer and song above horded gold, it would be a merrier world.” In today's world, where the economy and money seem to be on everyone’s mind, it’s important that we don’t forget what’s truly important: family dinners, jokes with friends, the people we love, and those who don’t come with a price tag. There are many forces at work in The Lord of the Rings trilogy, but when asked what he believes keeps evil at bay, the wizard Gandalf answers mercy. “Many that live deserve death. And some that die deserve life. Can you give it to them? Then do not be too eager to deal out death in judgment. For even the very wise cannot see all ends.” It is fascinating to think that the mercy Bilbo showed in Tolkien’s first, thin story could have such a great impact in his three-part epic. What’s more, the same is true for our own lives. Even if we can’t see them, our actions have consequences, and the grace we show to others is always remembered. J.R.R. Tolkien lived through two World Wars; he knew better than most that no victory comes without a cost. This theme of sacrifice is ingrained in his novels and in the essence of his characters, none more so than Frodo Baggins. 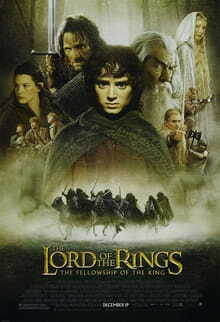 Frodo gave up his peaceful life at home in order to destroy the Ring, knowing the mission would likely claim his life. In the end, even though Frodo survived his journey he could not go back to his life in the Shire. He had given everything to protect the world, and now, he had no place in it. As Christians, sometimes we are called to surrender the things we love most in order to preserve what Christ has done. It may be our hard-won careers, our deepest dreams, perhaps even the desire for a family of our own. It is a cold and bitter truth, but like Frodo, Christ does not leave us alone and without hope. There are some pretty heavy moments in Tolkien’s writing. There are good people who suffer, while others give in to the darkness, but no matter how far a character falls there is still always hope and the opportunity of forgiveness. Even a character like Boromir, who betrays his companions, ends up finding redemption in the end. For Christians, the message of hope is a powerful one, and it is very comforting to find it within the pages of The Lord of the Rings. There is a quote in The Return of the King where Pippin asks Gandalf if there any hope for them, “There was never much hope,” the wizard replies, “Only a fool’s hope.” And yet, that is all that’s really needed. Despite all the adversity we might face in life, God’s grace is still present, and no matter what we’ve done he can still use us to demonstrate His glory. One of Tolkien’s greatest gifts to his readers was the message that hope exists, even when we're faced with overwhelming odds.